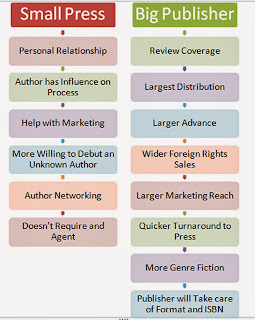 Small Press Compared to Big Publisher and why I need "to Agent, to Agent, to get a fat Contract"
And I did all that. And I submitted my novel, "The Precious Quest" to three of the biggest fantasy publishers who accept submissions from authors. A year and a half later, and three rejections later, I have run out of big publishers who accept high fantasy and who accept from unagented authors. Still confident, I felt I could get my 90,000 word, high fantasy that took six years to write, published by a small press. Did I say "six years"? Did I say "90,000 words"? "The Precious Quest" will probably be the most difficult novel I will ever write. I will never again invest the time and effort and research into a manuscript with such single-minded devotion. I wanted to write an quest and I did, right down to world-building, maps, language development, drawing on ancient texts and customs and mythologies, and creating the most riveting characters and complex plot I could imagine. And so the real question is, "Do I really want to send this manuscript to a small press"? The plan was to finish and then, submit "The Fergus She" to a small press and use it as a stepping stone to get "The Precious Quest" to a large publisher. Only, I ran out of large publishers who accept new author submission options for the PQ and the FS isn't edited yet. I'm not getting any younger, and Laywren (my protagonist) is begging for a platform. When I am in doubt, I always make a T-Chart. I took a good look at the benefits of small press versus big publisher and here is what I found. 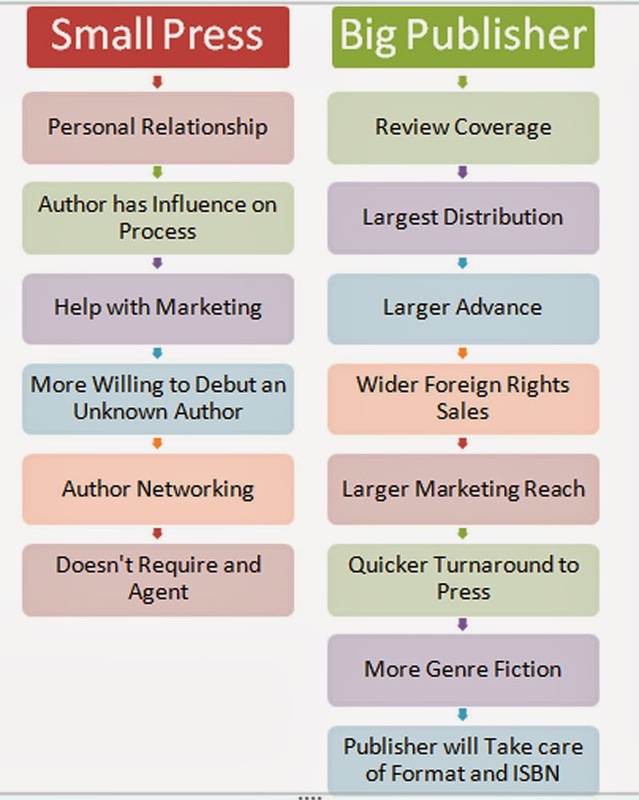 Obviously the above comparison of publishers is based on generalized research and there will be small presses and big publishers who do not fit these generalizations. More importantly, the number of listed benefits is not what should influence our decisions. It's the listed items that should sway our submission choice. For "The Precious Quest", I am looking for a publisher that has a proven track record with Epic Fantasy, a large distribution and marketing reach, and quicker turnaround for press time. Big publisher is my choice and to get my manuscript to a big publisher, I need an agent. My original decision not to have an agent has to change. Flexibility is obviously just one more trait writers need to succeed. The little fear bubble in my brain is whispering, "What if you get an agent, give up 15% of sales, and they get you a contract with a small press?" I currently don't have the answer to that question, but in my next blog, I'll write more about agents and how my search is going.